Poliomyelitis is an infectious viral illness affecting the central nervous system. Poliomyelitis continues to be a health hazard in most underdeveloped countries, although its incidence has been decreasing. The introduction of the vaccine has helped to control the spread of polio. The extensive use of polio vaccines since 1954 has virtually eliminated the disease in developed countries. Poliomyelitis is caused by a virus. The viruses, after they are ingested, make their way into the digestive system, from where they multiply and enter the blood stream. They then lodge in specific areas of the nervous system to cause the disease polio. The virus belongs to a class of viruses called RNA viruses. The infection of the central nervous system occurs in a very small percentage (about 1%) of cases resulting in varying degrees of paralysis. Polio in India has certainly shown a declining trend. It is a significant achievement and makes the goal of polio eradication a reality. In order to estimate the extent of the problem “Lameness” surveys have been carried out. It takes into account the number of people who have become paralyzed on account of polio. It is a diagnosis which can be quite easily made. In 1995, provisional figures indicate that 3,406 polio cases were reported as opposed to 20,000 cases in 1986. 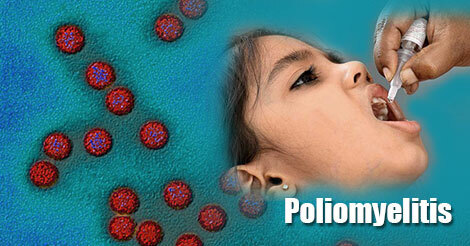 Polio infection is known only to occur in human beings. Therefore, it is potentially an eradicable disease. Polio viruses can survive for long periods in the external environment. There are three types of polio viruses or stereotypes 1, 2 and 3. Most outbreaks of paralytic polio are due to the Type 1 virus. Most infections are sub–clinical. It is the mild and sub–clinical infection that plays a dominant role in the spread of infection.